Posted on February 2, 2017 at 11:55 am. On any given night, in every county of our state, many youth and young adults have no family to eat dinner with, no safe place in which to do homework or no bed to sleep in. “Patricia” lived with her grandmother for most of her adolescence, but due to poverty she became homeless in her late teens. In addition to facing addiction to cope with her struggles, she received a devastating cancer diagnosis. Without a place to live, “Patricia,” now in her early twenties and living in the Yakima-area, had no place to call home. No young person should go through this alone. The good news is that we can make it better for “Patricia” and the nearly 13,000 unaccompanied youth and young adults (ages 12 to 24) who access homeless support services each year in Washington. The time to act is now. In our state, momentum is building to prevent and end youth homelessness. King County recently was named one of 10 communities across the country to receive a federal grant to tackle youth homelessness. At the state level, two new efforts are positioning Washington to become a national leader on this front. 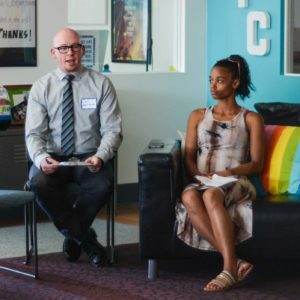 The newly formed Office of Homeless Youth, a Department of Commerce effort, is working to understand the unique challenges communities face and to find solutions that work for vulnerable young people. Recognizing that government can’t do it alone, partners and advocates recently came together to launch A Way Home Washington, a growing movement dedicated to helping communities prevent and end youth homelessness. Because we can’t identify solutions if we don’t fully understand the problem, A Way Home Washington and the Office of Homeless Youth traveled across the state with First Lady Trudi Inslee to gain a better understanding of the hurdles young people and their communities face. This contributed to a new Office of Homeless Youth report that highlights three actions we can take now to turn the tide on youth homelessness. • Ensure youth who are leaving social services have a safe place to go. In a single year, more than 1,700 young people experienced homelessness after aging out of foster care, exiting a juvenile-justice facility or leaving a chemical-dependency treatment facility. We can prevent this through strategies like supporting foster youth to enroll in Extended Foster Care, ensuring that they remain in safe housing until age 21 and developing comprehensive transition plans to stable housing. • Invest in crisis intervention and diversion to help prevent homelessness in the first place. Families should not have to lose their teenager to the streets, foster care or the juvenile-justice system. Early interventions like family reconciliation and mental-health support help families stay together in healthy relationships and tackle underlying causes of homelessness. • Improve education and employment outcomes. In just our K-12 public schools, we have nearly 6,000 unaccompanied students, meaning they’re homeless and not in the physical custody of a parent or guardian. As lawmakers debate the need to fulfill McCleary and fund public education, we cannot forget those students who do not have a home to return to after the bell rings. We must work with schools to identify these students and connect them to services that support their academic success. To accomplish these initial steps and more, Gov. Jay Inslee has directed an interagency work group, led by the Office of Homeless Youth, to establish an integrated and consistent statewide approach this spring to preventing and ending youth homelessness. Every family navigates tough times, but we can’t let any young person slip through the cracks. Washington can both prevent and end youth homelessness here at home and become a model for the nation in finally ensuring every young person has a safe place to call home. When our young people succeed, we all succeed. That’s why we must continue working together to prevent and end youth homelessness in Washington state. For young people like “Patricia” and her family, time is of the essence. Kim Justice is executive director of the Office of Homeless Youth, Washington State Department of Commerce. Jim Theofelis, a state licensed mental-health and chemical-dependency counselor, is executive director, A Way Home Washington. Posted on January 17, 2017 at 11:21 pm. By Sarah Hunter and Katie Hong and re-published from The HUDdle, U.S. Department of Housing and Urban Development’s Official Blog. A stable home is critical to the development of children and young adults. When they spend their energy wondering where they’ll sleep and what to eat, it’s nearly impossible for them to focus on doing well in school and preparing for their future. On any given night, more than 45,000 unaccompanied youth and young adults experience homelessness. Yet, youth homelessness is often an invisible problem, as young people are often not in plain sight. Many don’t know where to go to ask for help and many communities lack dedicated youth services. Despite these limitations, philanthropy and federal partners have come together to commit to ending youth and young adult homelessness by 2020. To accomplish this goal, HUD and its federal partner agencies are joining with several philanthropic organizations, including the Raikes Foundation, to align investments and resources in order to ensure that homelessness among youth and young adults is rare and are brief occurrences. As part of the Delivering Outcomes for Communities Training, hosted by the Office of Management and Budget and the Partnership for Public Service, HUD and Raikes Foundation colleagues discussed how they developed their partnership, their strategy for ending youth homelessness, and the benefits of government partnering with philanthropy. By first establishing a common goal, federal and philanthropic partners are working to design and execute a comprehensive plan to end youth homelessness. Experience reducing Veteran homelessness informed the strategy for to end youth homelessness. support the field with the establishment of A Way Home America, to speak with one voice about what actions and resources are needed. This cross-sector partnership takes advantages of the strengths of all parties involved to advance progress. Philanthropy is often able to be more flexible and nimble than government, allowing them to fund crucial backbone efforts to coordinate stakeholders in the field. While government set the vision through Opening Doors, the nation’s first comprehensive federal strategy to prevent and end homelessness, philanthropy and government partners align investments in meaningful ways and amplify lessons learned about what is working. HUD understands that the complex issues facing our communities, like youth homelessness, must be addressed through coordinated approaches that facilitate many stakeholders working together. To achieve our common goal, HUD and the Raikes Foundation will continue to work with others to maximize the expertise and resources of a network of partners dedicated to ending youth homelessness in our country. Posted on September 23, 2016 at 4:59 pm. If you are like many of us here at A Way Home Washington, you spent July and August soaking up as much of the Rio Olympics as possible. As you were watching, you might have asked yourself, What makes Simone Biles so dominant in gymnastics? Turns out, one reason is that Simone has such a powerful run, she can begin her tumbling passes earlier, giving her more room to flip and twist. Access to data helps us answer so many questions—not just about our favorite athletes, but also about some of the most urgent issues our society faces. And quality data does more than raise awareness or find answers. It helps point to ways we can better spend our money, focus our time, or allocate resources to save and improve lives. Think about how you make decisions about the products you buy. You compare reviews, examine the cost and effectiveness of various products, and ask friends about their experiences. With all that data and information combined, you make a well-informed decision for you and your family. The problem we face here in Washington state is that, for years, we’ve lacked detailed, accurate information about the state of youth homelessness. As a result, thousands of youth are forgotten and left behind. That’s why A Way Home Washington commissioned a landscape analysis of youth homelessness in the state. The scan focused on five communities: Spokane County, the south sound, Walla Walla County, Yakima County, and a cluster of rural regions across the state. It documented each area’s demographic statistics, available programs for youth, capacity to support and address youth homelessness, and identifiable community needs to expand these programs and services. Youth experiencing homelessness stay local: 86 percent of youth experiencing homelessness access services in the same zip code of their last permanent address. We must improve social services: 28 percent of youth exiting the foster care system are homeless within 12 months, and that number is 26 percent for youth exiting the juvenile justice system. Once a young person is housed, they stay that way: Only 2 percent of youth accessing homeless services returned to homelessness from transitional or permanent housing. Ensure consistency at school: Make sure students experiencing homelessness keep their Individual Education Plans—developed for each public school child eligible for special education—if they change schools. Enhance statewide data to inform decision-making: Develop a statewide dashboard to monitor progress against key metrics in youth homelessness, and disaggregate the data by race to ensure that progress is equitable. Strengthen communication among service providers: Improve communications around licensing for shelters, host homes, and foster care programs, and create relationships between juvenile detention centers and youth housing providers to prevent discharging youth from detention to the streets. This scan—one of the most complete aggregations of local data to date—makes it clear that while many approaches to ending youth homelessness can and should be tailored to communities. They shouldn’t exist in silos. There are so many things we still want to learn, though, and that’s why A Way Home Washington is currently on a Listening & Learning Tour across the state. 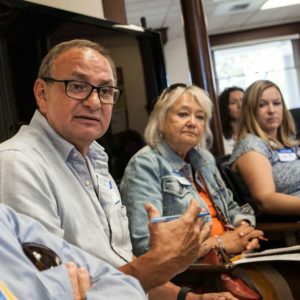 It started August 16, with First Lady Trudi Inslee and Kim Justice, Executive Director of the Washington Office of Homeless Youth, sitting down with youth and community leaders in Yakima. They’ve also stopped in Tacoma, Vancouver, and Everett to learn about common barriers and solutions for ending youth homelessness, and understand what unique challenges exist. At the conclusion of this tour, we’ll report out what we’ve heard from communities. Combined with the qualitative findings in this scan, we will be able to explore targeted, tailored, and transformational solutions to help end youth homelessness in this state. If we’re successful, maybe we’ll inspire the next Simone Biles. At the very least, we’ll help the next generation of young people in this state to reach their full potential. Posted on September 10, 2016 at 5:06 pm. As a lifelong Washingtonian, I’ve seen time and time again that people in this state come together to solve problems and lend a hand when someone is in need. I am witnessing this commitment first-hand on a Listening & Learning Tour for A Way Home Washington. We are traveling to communities across the state to learn more about youth homelessness and how we can help communities implement strategies to prevent and end it. I recently visited partners and community leaders in Pierce County, along with Kim Justice, executive director of our state’s Office of Homeless Youth. We gathered at Oasis Youth Center, a drop-in and support center dedicated to the needs of LGBTQ youth. use of their sexual or gender identity, or even been forced into prostitution. year old Tomica White was homeless for most of her adolescence. She’s relied on recently opened shelter services from Community Youth Services since December 2015. Community Youth Services also works with shelter residents to help them transition to permanent housing. They already helped 33 people find housing, and I was thrilled to learn that Tomica will soon receive the keys to her own apartment. We know that solutions need to be tailored to represent the unique challenges young people like Tomica face in their hometown. For example, we heard in Pierce County that youth in rural areas—who lack reliable transportation—struggle to access services available in Tacoma. One young man, who volunteers his time to help his peers, sharedthat he once rode his bike from Tacoma to Eatonville to check on a friend who was in an unsafe environment and was unable to make the trip to Tacoma. More integration across sectors so everyone that interacts with youth—at school, day centers, shelters, and other service providers—knows what kind of help is available for young people in need. We still have work to do. But the progress in Pierce County, and the passion I heard from committed partners and community leaders, leaves me optimistic. We have two more stops in the Listening & Learning Tour: in Snohomish and Clark Counties. But my hope and Kim’s hope is that our statewide network of partners is strengthened through A Way Home Washington so every partner feels like they have an opportunity to voice their ideas and concerns. Mrs. Inslee serves as honorary co-chair of A Way Home Washington and is the First Lady of the State of Washington.